Happy Holidays Everyone! I hope you will excuse my brief blogging hiatus as I was gearing up for the Holidays just like all of you! Today I really wanted to share with you one of my Holiday Party outfits since I had a difficult time figuring out what to wear this year. Maybe I am just getting old or I have an aversion to freezing at these events but the go-to sparkly mini dress has completely lost its appeal this year. Santa did not bring me a floor length mink coat that would sole the freezing problem so I wanted to actually wear clothing and layers. So layers, no mini-things, check, but that doesn’t mean I couldn’t sparkle in an updated modern way. Velvet may be a thing of our childhoods but its recent resurgence especially around the holidays provides us with a chic alternative to sequins without sacrificing the flair. This Topshop velvet skirt has been a year round staple for me because it is not only stylish and a statement piece but it’s also comfortable! Who would have thought. 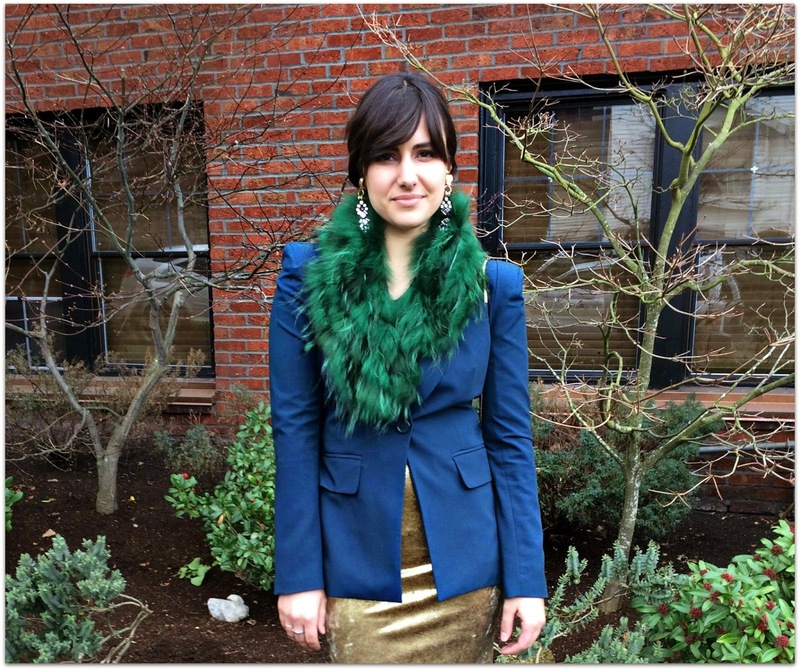 As far as the blazer and furry scarf, I tend to wear these two together whenever I am going for a 70s Gucci vibe (SUCH a trend right now) but the colors also work well for the holidays. The tailoring of the blazer makes this outfit dressy and yet classy at the same time showing my shape without being too revealing and this dyed fur scarf adds such a whimsical holiday feel, paired with the skirt it felt like a winning combination. Lastly I added statement earrings an evening clutch, some matching heels and voila! I felt sufficiently party ready, sophisticated and like I still was making a bold fashion statement. The best part? I had everything already in my closet no shopping needed (shocking I know) so before reaching for the gold sequin mini dress this year maybe try something new and become the most interesting and stylish person at the party instead. Happy Holidays, I hope you all are having a wonderful time with your families as I know I am! Outfit details below. Cheers! Thank you so much! Those earrings were an ASOS find that I probably wear too often. Thanks for stopping by!